The attractive holiday cottage is situated in the grounds of the main house, echoing the old-world character of the main house. An open plan living room with kitchenette is on the ground floor. A double bedroom and bathroom are on the first floor. The kitchenette is equipped with electric cooker, microwave, refrigerator and all necessary cooking and dining utensils. There is a colour television in the lounge. The cottage has full central heating and bed linen is provided. The lodge is completely self contained within a wing of the main house and echoes the old-world character of the house. The kitchen and dining area are on the ground floor, with the bathroom, living room, double bedroom and twin bedrooms on the first floor. The kitchen is equipped with electric cooker, microwave, refrigerator and all necessary cooking and dining utensils. There is a wood burning stove and colour television in the lounge. The lodge has full central heating and bed linen is provided. 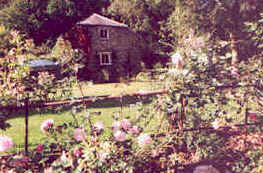 Pets are welcome to stay in both self catering cottage. Guests are kindly requested not to smoke whilst inside any of the accommodation.